Bampton to Tiverton Road Race start 2016. Pictures from the Tiverton Gazette. Finish line at Heathcoat Factory with John Harvey winning it again in 1947. Picture taken from Tiverton Museum of Mid-Devon Life. 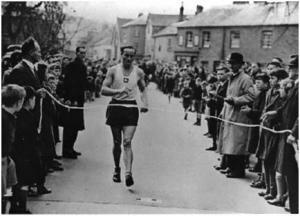 The first Bampton to Tiverton Road Race was held on 22nd April 1946 with 27 competitors. It was won by John Harvey from Tiverton in a time of 42 minutes 19 seconds. The 7-mile race has been held virtually every year since then. 2016 marked the 70th anniversary of the race. 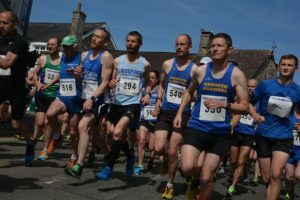 The scenic route follows country roads with views of the Exe valley from Bampton to Bolham where runners climb the steepest hill of the course. Runners pass the front lodge of Knightshayes Court then cross the bridge over the North Devon Link Road. The race finishes in Peoples’ Park, Tiverton which overlooks Tiverton Town Football club and is above Exe Valley Leisure Centre. The race has an entry limit of 250, so make sure that you enter early to avoid disappointment. All race numbers are to be collected from Race HQ on the day from 8.45am. Entries on the day will also be available from this time subject to the race entry limit not being reached (there is an additional £2 fee for on the day entries). Race HQ is at Tiverton Town Football Club, Bolham Road, Tiverton,EX16 6SG. There is free car parking at the football club and changing facilities and showers are also available. From Tiverton Football Club you’ll catch a free bus to take you to the start at the White Horse in Bampton where the race will begin at 10.30am. Please ensure you arrive early to register in order to allow enough time to travel to Bampton. A supervised baggage area is located at the Tiverton Town Football Club. Each runner will be issued with a bag with their race number on it so that they can wear their tracksuit to the start. A baggage bus will return these bags to the Tiverton Town Football Club where they will be removed and stored in the baggage area, from where they can be collected after the race. 1ST MALE & 1ST FEMALE £50.00. 2ND MALE & 2ND FEMALE £25.00. There is also a children’s fun run which is held in the Peoples’ Park (where the road race finishes) from approximately 10.00am which can be entered on the day (£4 entry fee). This is approximately 1 mile long and is open to children of all ages (toddlers included but must be accompanied by an adult). This race is not timed but there are medals for all who take part. After completing the 4 day course, consisting of theory and practical based learning, concluding with a days practical assessment, Harriers are pleased to announce that Tamsin and Kat are now qualified Coaches in Running Fitness ???? If you’re not a Harrier and you’re thinking about getting involved with a running group then rest assured that you will be assisted by qualified, insured and knowledgable coaches - just come to Heathcoat Factory for 6.15 on Tuesday and Thursdays. One for those Harriers that like trail running. One of the events is at Haldon.